Whether you want to create the perfect ambience for special nights or create colorful and festive warmth this holiday season, these gorgeous candles are not to be missed. Inspired by the colors and vibrancy of life in Africa, these hand-painted candles create unique effects when lit. This candle design is part of our Samaki Collection. Want it in a different shape or size? Browse the Collection here. "In Africa everyone is an artist"
The art of creating is not purely confined to those who call themselves "artists". 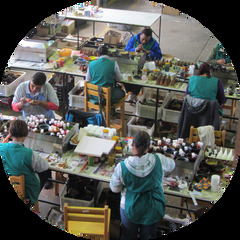 The craftsmen and women of Nobunto come from the winelands, the city, and the township. Some have been trained and some have learnt on the job. As a company firmly connected to its local community, it generates interest from local artists who wish to express themselves through the work of Nobunto. For both artists and craftsmen, Africa provides the ultimate inspiration. The word NOBUNTO comes from the Sotho language, meaning "For the people". NOBUNTO is a South African Fair Trade company that creates high quality hand-painted candles with the utmost attention to detail using mainly African inspired designs. Their mission is, in a region with high unemployment, to alleviate poverty, not only through development of industry but to be socially, ethically, and sustainably responsible. Based in the small village Napier, about 180 km east of Cape Town, NOBUNTO has provided employment to mostly woman of the disadvantaged community and guarantees an income for over 18 families. These unique candles are made with the utmost care and are in compliance with all safety regulations. However, please exercise caution when using by understanding how to best enjoy these candles without creating a hazardous situation. All Pillar or Cube candles (not tapers) should only be left burning for 2-3 hours during the first and second usage. The cooling off/down phase until the next lighting/usage should be at least one hour. The candle should not burn for longer than 2 hours during subsequent usage. The reason for the above is that the flame, in order to create the desired “lantern effect”, burn down in the centre of the candle, thereby creating the glow in which the external painted effect is clearly visible. However this very beautiful “lantern effect” produces enormous heat inside the candle which can cause the outer walls of the candle to melt, causing molten wax to leak and run out. Please enjoy safely and responsibly.